Hunk of Beef Au Jus Dog Food has been recalled by Evanger’s after it was found to have the drug Pentobarbital in it, causing the death of one dog an making five other dogs sick, according to the Wheeling, Ill.-based company. Pentobarbital is used to anesthetize or euthanize pets. The food affected is 12-ounce cans that were manufactured June 6-13 and sold in stores and online in Washington, California, Minnesota, Illinois, Indiana, Wisconsin, Ohio, Pennsylvania, New York, Massachusetts, Maryland, South Carolina, Georgia and Florida. “Although pentobarbital was detected in a single lot, Evanger’s is voluntarily recalling Hunk of Beef products that were manufactured the same week, with lot numbers that start with 1816E03HB, 1816E04HB, 1816E06HB, 1816E07HB, and 1816E13HB, and have an expiration date of June 2020. The second half of the barcode reads 20109, which can be found on the back of the product label,” Evanger’s states. Evanger’s is paying the vet bills of the dogs who became ill and is also making a donation to a local shelter in honor of Talula the Pug who died, according to Detroit Free Press. For questions, consumers may contact the company at 847-537-0102, 10 a.m.-5 p.m. Central weekdays. 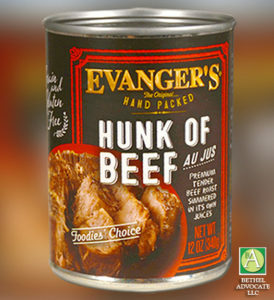 In an abundance of caution, Evanger’s has made the decision to voluntarily recall five lots of Hunk of Beef. Although nearly all product involved in this recall have already been consumed by pets without incident, we have decided to initiate the recall as a proactive measure against the remote possibility of any illness. Although only one household in the country reported illness, out of the five lots that are being recalled, we feel it is the right thing to do. This is our first recall in the 82 years that we have been in business. The Facts: We feel that we have been let down by our supplier, and in reference to the possible presence of pentobarbital, we have let down our customers. Despite having a relationship for forty years with the supplier of this specific beef, who also services many other pet food companies, we have terminated our relationship with them and will no longer purchase their beef for use in our Hunk of Beef product. As Hunk of Beef is a very unique product, requiring very specific cuts of meat, this supplier’s meat was used in no other products. Something like this seemed impossible. We were unaware of the problem of pentobarbital in the pet food industry because it is most pervasive in dry foods that source most of their ingredients from rendering plants, unlike Evanger’s, which mainly manufactures canned foods that would not have any rendered materials in its supply chain. All of our raw materials are sourced from USDA-inspected facilities, and many of them are suppliers with whom we have had long-standing relationships. In our investigation, we spoke with many suppliers to learn how it could even be possible that an animal that had been euthanized could ever possibly end up in the animal food stream. What we learned was that pentobarbital is very highly controlled, and that, if an animal is euthanized, it is done so by a veterinarian. Once this process has been done, there is absolutely no regulation that requires the certified Vet to place any kind of marker on the animal indicating that it has been euthanized and guaranteeing that product from euthanized animals cannot enter the food chain. This is a simple task, and goes a very long way to ensure safety in many areas. Since the launch of this investigation, Evanger’s has acted as openly and transparently, sharing all test results, what we as a company were doing to continue the investigation, and all facts of the investigation. Once we learned of the term, “pentobarbital,” we spent many hours trying to find a lab that would test for the presence of pentobarbital in a meat substance. It turns out that most labs only test for this in humans. Eventually we did find a lab, and have cans currently being tested, the results of which we plan to share with the public once they are available. In addition to fully-funding the veterinary bills for the dogs that became ill Evanger’s will be making a donation to a local shelter in honor of Talula the Pug. Evanger’s will continue its unwavering commitment to pet nutrition and health, and our family greatly values the incredible partnership and continued trust with pet owners in the U.S. and across the world. Wheeling, IL – (February 3, 2017) Out of an abundance of caution, Evanger’s Dog & Cat Food of Wheeling, IL is voluntarily recalling specific lots of its Hunk of Beef product because of a potential contaminant Pentobarbital, which was detected in one lot of Hunk of Beef. Pentobarbital can affect animals that ingest it, and possibly cause side effects such as drowsiness, dizziness, excitement, loss of balance, or nausea, or in extreme cases, possibly death.